« FREE ~ FRESCHETTA by the Slice Event Coming Soon ~ Get FREE Pizza on August 4th! I don't know a person alive that doesn't like donuts in one way or another. Whether your weakness is the basic glazed donut, chocolate covered donut, spice donut or powdered donut, everyone goes nuts for donuts! Unfortunately, as with every other food that tastes delicious, donuts are not a very healthy breakfast choice, mostly due to the fact that these tiny pastries are fried in oil. 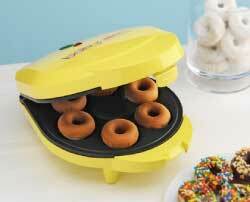 Now, with the Babycakes Donut Maker, you can bake yummy donuts in your own kitchen and save yourself a trip to the corner bakery. Keep reading to learn more! 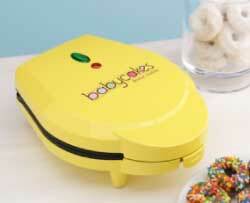 I reviewed the Donut Makerfrom Babycakes, which retails for $24.99. The Babycakes Donut Maker is a countertop model which allows you to cook six light and fluffy mini donuts in about four minutes. Add your favorite toppings and serve up a sweet treat that's perfect for a quick snack, breakfast on the go or even the main dessert for a child's party. The Babycakes Donut Maker comes complete with a small recipe booklet, wire cooling rack and two-pronged fork for removing cooked donuts from the machine. The nonstick coating of the Babycakes Donut Maker makes cleanup fairly easy and periodically you should wipe the cooking surface with a small amount of vegetable oil. I wish that this device would have had removable cooking plates, for I like to thoroughly wash any cooking surface and that's hard to do since you can't get this machine wet. 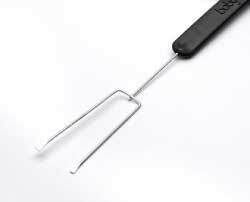 I also must admit that I don't understand why the company would provide a metal two-pronged fork with the Babycakes Donut Maker, when their instructions say that you shouldn't scratch the nonstick surface with the metal. 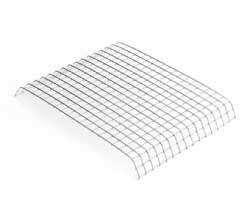 Everyone knows that you should never use metal on nonstick, so I don't understand why the included fork wasn't made from nylon. 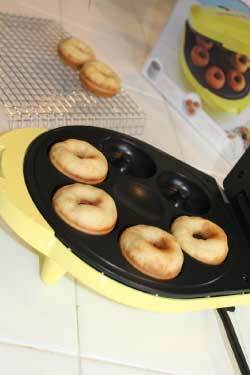 The only other feature of the Babycakes Donut Maker that I didn't care for was the recipe booklet itself. First of all, I'm not one who has the time anymore to cook many things completely from scratch, and unfortunately, all of the recipes that were included require you to do just that. Once you factor in the time it takes to make the batter from scratch, make the icing from scratch and cook only six at a time in this machine when each recipe makes 24-28 donuts, you've spent around an hour's worth of your time. For me, I think I'd rather just make a 5-minute run to my local bakery and pick up the donuts. I also was a little disappointed that the recipe booklet only showed how to make sour cream donuts, chocolate donuts, buttermilk spice donuts and maple glazed applesauce donuts. It seems to me that there should be more varieties included in their cookbook. Of course, these are just my opinions, but I didn't feel that the Babycakes Donut Maker will be used much in my household. Making a batch of these donuts just takes up too much time, isn't the easiest to clean and doesn't offer enough recipes in the enclosed booklet. But, if you are wanting to find a way to cook up a healthier batch of donuts, then perhaps the Babycakes Donut Maker is for you. These donuts are baked, not fried, and because you control every ingredient that goes into these donuts, it's easy to alter these recipes for those that have dietary restrictions. Disclosure: I wrote this review while participating in a campaign by Mom Central Consulting on behalf of Babycakes and received a product sample and a promotional item to thank me for taking the time to participate. Interesting. I came here expecting a glowing review..it seems a lot of people do those..and it is nice to see such honesty. I, too, have wondered in the past why a company includes utensils not meant to be used. What is with that? Thanks for this review. 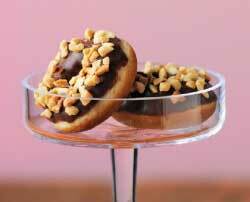 I am in serious search of a “healthy” doughnut. They exist, right? Thanks so much for stopping by and commenting! I’m so glad you liked my review, for I really do my best to try and be honest, without being overly critical. While I think the Babycakes Donut Maker could probably provide a “healthy” donut of sorts, alas I don’t have the time to go through all of the preparation to get there. :tear: Good luck on your quest! Have a wonderful weekend! It’s so cute & adorable though, I ‘d love to have one of these. I could make me up some splenda/sugar free baked doughnuts that would be awesome. Great comment! That’s so true…because you’re making the Babycakes donuts from scratch, it is super easy to modify the recipes anyway you want. Thanks so much for stopping by and have a wonderful weekend! I appreciate seeing a review that doesn’t sugar coat (no pun intended). I was looking at a donut maker at a store and was wondering if anyone really uses it. Thanks so much for your comment, Tammy! I’m sure that many people might really love this machine because it makes baked donuts and it’s so easy to customize the recipes, but I guess I’m just not the “bake from scratch” kind of gal when it comes to donuts. Hope you have a wonderful weekend!